Ever since they were established back in 1995, Connection has always believed that “good design is good business”. In 22 years, Connection have prided themselves on being able to form and sustain trusting relationships with all their clients. Connection are constantly looking for the best furniture designers across Europe and the United Kingdom to invest in developing new and innovative products. Because of this, Connection is able to adapt to the ever-changing office furniture market, quickly and efficiently. Over the past few years, Connection has placed a great amount of emphasis on being pro-active in their social responsibilities. All of the materials are procured from the most sustainable sources and their construction methods aim to be the best in the business; Connection always aspire to protect the environment, particularly with furniture recycling wherever possible. Flexible and ergonomic office furniture makes people more productive; this has always been a firm belief of Connection, which inspired them to design their Liquid Workspace concept. Instead of separating individual workspaces, this concept brings them together in a way to maximise productivity and relax your employees. Every business needs somewhere for its employees to meet and discuss things in comfort and style. Connection’s meeting booth furniture brings together modern style with efficiency. One of their most popular meeting booth products is the Hive, which encourages workers to sit in a circular or rectangular layout. This maximises productivity and ensures that everyone is involved with the meeting. For those businesses that require long periods of sitting, inviting and comfortable breakout areas are of great importance. But just because a chair or sofa looks great, doesn’t always mean that it’s comfortable. Connection’s range of Hive office furniture offers a contemporary style that is comfortable and still able to fulfil all the traditional roles you would expect. 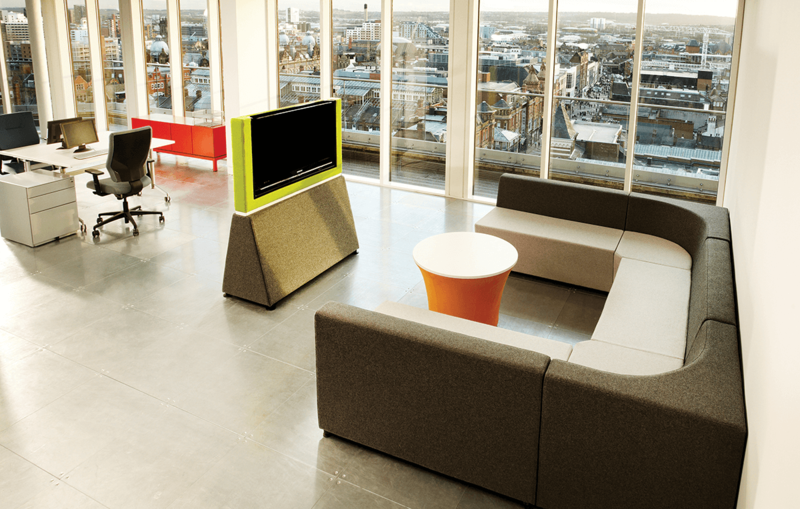 Hive can be used for a variety of purposes, from a reception area to breakout area furniture and sofa booths. Connection believes that seating can really set the tone of an office space, which is why they will provide clients with a complete brochure showing all of their designs and colour options. Each design has undergone a thorough ergonomic assessment to ensure that they are completely comfortable and supportive for your employees. Connection can offer you some of the most competitive prices available, and their products can be adapted to suit a variety of budgets and there are no hidden charges given to you at the end of the process. Here at Rapid Office, we have an excellent relationship with Connection. Contact us now for professional service, expert knowledge of the office furniture industry, and the latest products from this manufacturer.